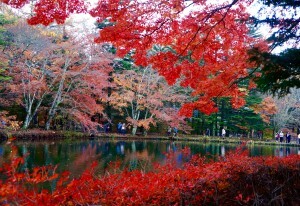 Rikugien Garden (六義園) in Bunkyō-ku is considered as one of the most beautiful traditional Japanese garden in Tokyo. Evening illumination is also available in the garden giving the trees an almost magical appearance. The illumination period for this year is from November 20 to December 7 with last entry at 8:30 pm. 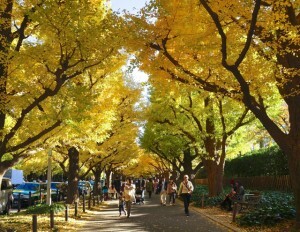 The Icho Namiki (銀杏並木) or Ginkgo Avenue located in Meiji-jingu Gaien Park, just a short walk from Aoyama-Itchome Station, is one of the most popular autumn viewing spot in Tokyo. Around 300 meters long boulevard turns into a golden corridor which seems to transport visitors to a different world. 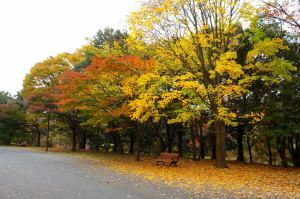 Showakinen Park located in Tachikawa has about 163 hectares land area. 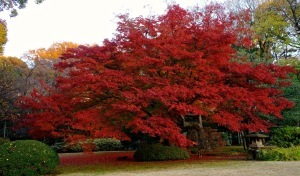 The koyo season around the park usually tends to begin earlier than most of the Tokyo parks, which starts around late October and peak either mid or late November. The town is situated on a plateau with an altitude of about 1,000 meters and surrounded by various mountains giving it a breezy and refreshing environment. The town offers various outdoor activities, scenic locations, shopping opportunities, and relaxing dining places. 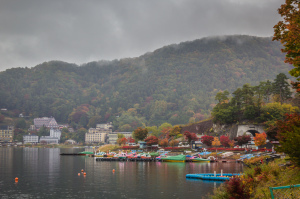 Lake Kawaguchi provides a good spot to view Mt. Fuji from a close distance and it is also one of the best places to enjoy the autumn colors. Mt. Tanigawa (谷川岳, Tanigawadake) is listed as one of ‘Japan’s 100 Famous Mountains‘. It has an elevation of 1,977 meters and possesses rugged, rocky, steep and tricky slopes. 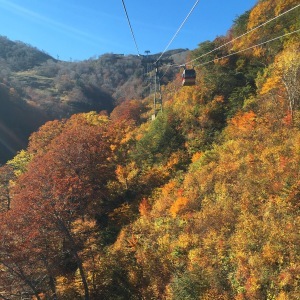 It is also an outstanding destination during the autumn season as the area offers wonderful vistas of fall colors as the leaves change in the surrounding valleys. 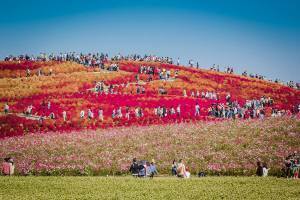 Hitachi Seaside Park (国営ひたち海浜公園 Kokuei Hitachi Kaihinkouen) located in Hitachinaka, Ibaraki, Japan is a 190-hectare national park and is one of the best places to visit during the autumn season. The colorful cosmoses and blazing red kochia bushes or commonly known as burning bush, ragweed, summer cypress, or Mexican fireweed covering the Miharashi hill.